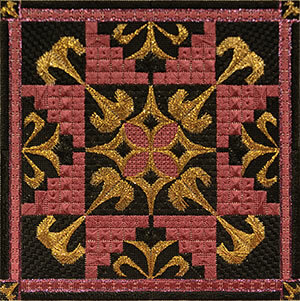 Brenda E. Kocher designs are elegant, original, canvaswork embroidery designs, which showcase a wide variety of textured stitches and utilize only the finest of Italian silk and specialty threads. These designs range in size from unique miniatures, worked on 40 count silk gauze and small 3" x 4" firescreens to larger pieces, which are evocative of Victorian floral watercolors, and are worked on 18 count mono canvas. All designs are in book form and have been written with extensive instructions that are very easy to follow and understand. Each book is labeled with the skill level: beginner, intermediate, or advanced, and all may also be easily taught as one, two, or four-day classes. For retail sales please contact Half Moon Handwerks. The aurora borealis shimmers and dances in the Alaskan night sky and in this latest design. Kreinik metallics in shades of pink, purple, green, blue, lavender and silver shimmer against the black of the night sky. Look for it in the July/August issue of Needlepoint Now. 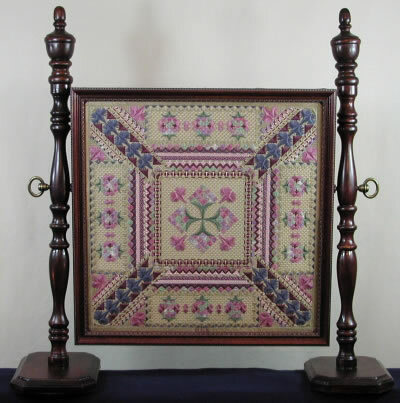 The Online Needlework Show is the only wholesale needlework show in the virtual world! They're a little bit different, a little bit new, but it IS a trade show (buyers pre-register and are verified as a business owner; vendors reserve "booth" space and sell directly to buyers), but...this is the little bit different part...unlike other trade shows, it provides General Viewing pages! Show dates are April & October. 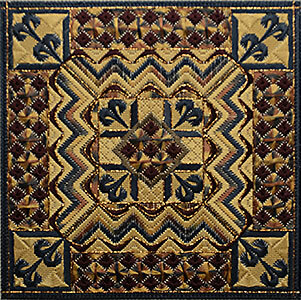 Just go to: www.needleworkshow.com to see lots of great new designs and products. If there's something you like, just contact your local needlework shop or one of the registered buyers for the show. They would love to help you with your order! I have several new designs in the show that you won't want to miss seeing! You can sign up to be notified of any changes to this site by putting your email address in the box below.